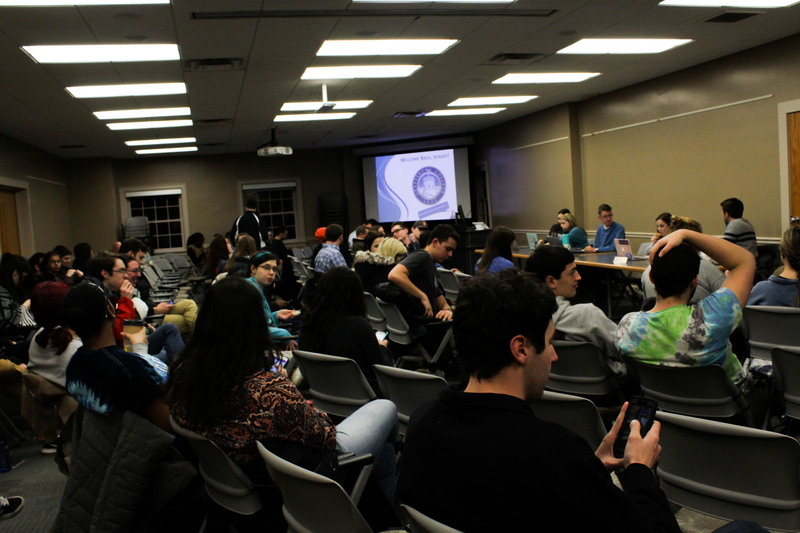 Senate Sails Through Meeting, Adjourns | The Gettysburgian. Even starting a few minutes after 7, the Gettysburg College Student Senate concluded its meeting by 7:45 p.m. Monday evening as the body sailed through a light agenda. During the student concerns portion of the meeting, Senator Marisa Balanda ’21 expressed frustration over the college’s decision not to give priority housing to residents of the Hanson Hall basement forced to relocate due to mold. Instead, all residents of Hanson Hall will receive $250 in compensation. While an email from Associate Dean of College Life for Residential and First-Year Programs Keira Kant sent on Jan. 24 indicated that basement residents would receive priority, that was before the college realized the scope of the issue extended to the first, second, and third floors of the building, Executive Director of Communications & Media Relations Jamie Yates told The Gettysburgian last week. Student Senate President Luke Frigon ’18 agreed with Balanda that, if priority housing was promised, that should be honored. “I think the college needs to stick to their word,” Frigon said in response to Balanda’s comment. Abby Hauer ’21, who was serving in her first meeting as a student senator, added that some basement residents had to discard property, the value of which is in excess of $250, due to mold and that the college has not responded to a request for further compensation. “The college should pay you back,” Frigon said, referring the matter to the Senate Opinions Committee for further, more formal action. Aside from the mold issue, Senator Nick Arbaugh ’20 implored all senators to read the statement on freedom of expression in anticipation of a discussion likely to occur at next week’s meeting. Senate is in a holding pattern with respect to the draft statement of institutional philosophy on freedom of expression as the final statement has not yet been released; Senate Policy Committee Chair Pat McKenna ’20 said that he anticipates the final version will be written and distributed later this week. The Spark Notes, a six-member, all-treble a cappella vocal ensemble, was recognized after giving a brief performance. The recognition was not unanimous. Rotaract, a partner of the Gettysburg Rotary that intends to assist with service projects through the Rotary and partner with other service organizations on campus, was unanimously recognized. Ski Club, which skis, was unanimously recognized. $527.94 was unanimously approved in reimbursement funds for the EMS Club, which has eight certified emergency medical technicians among its members, to send some of its members to a conference as well as to purchase auxiliary equipment for radios. $1425 was unanimously approved for the Black Student Union’s Step Afrika! event in April. The total cost of the event is $7125, but additional funding came from the Provost’s Office ($3000), the Theatre Arts Department ($1500), College Life ($1000), and the Africana Studies Department ($200).